Home » Trending Now » Why is Taco Bell Employee trending? If you live in the Ridgecrest, California area you may not want to visit your local Taco Bell today. 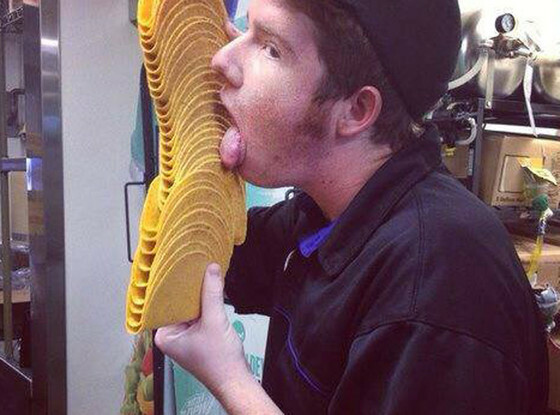 A picture has surfaced on Facebook that shows a Taco Bell employee holding a stack of taco shells and licking the middle of the stack. Here is the photo, and I hope you’re not eating a Taco Bell taco at the time! “This sure says a lot about your employees, food treatment, and what they post on the internet,” is what the Facebook poster said. Taco Bell quickly heard about the photo and released this statement, ”We have strict food handling procedures and zero tolerance for any violations. We believe this is a prank and the food was not served to customers.” This employee will definitely be fired but I’m not so sure that the tacos were thrown out. I suppose we’ll never know if anyone fell ill from the saliva tacos because Taco Bell makes a good majority of customers sick regardless.